There were numerous questions being raised by interested parties who want to buy or get the Master Siomai franchise. I wanted to have them all covered and featured on this particular post dedicated to small business men and women in the franchising Philippines arena as well as those who are interested to get this concept of business going. A popular rival however is the Siomai House who happened to have almost the same kiosk color (black color foodcart with a touch of red motiff as if having a Japanese aura / Japanese inspired) as what they earlier had. The first one though got a distinguishing factor which points to a claim via their official website tagline saying “The Pioneer Japanese Siomai Maker“. This, perhaps makes their franchise one of the most wanted in foodcart franchising industry. On the other hand, Siomai house, a popular product and franchise of Bernabest Food Products Inc had no official website. I only saw a blogspot on my way to search for more information. Master Siomai on the other side of the coin is a food cart business conceptualized and developed by Masterrific Foods. Searches reveal that this business is put up by a 9-year old company back in 2012 which means that as of today, 2012, it is already an 11-year old established small business idea in the Philippines and in the food cart franchise arena. 1. How did Master Siomai start as a business idea and how much foundation is expected of their foodcart franchise should you decide to avail or buy one? – This business actually started off with supplying processed meat products to different small and big clients all over Metro Manila and nearby provinces. Their supply includes Ham, Bacon, Burger Patties and especially Siomai. These products were sold and distributed to hotels, restaurants and market places, making it a first in this type of food distribution back many years ago. Their company’s success in the food processing and supply gave them a start up on a business idea to venture into foodcart franchising back in 2007 which gave them a 5-year old stable stronghold trust and delicious siomai food available through kiosks. This business in food cart started in providing delicious and mouth-watering pork siomai topped with crab sticks and wrapped with Japanese seaweed making their product original, authentic and best of all, unparalleled. They later ventured in giving more flavors with the introduction of the new siblings found on their pork, shrimp and beef siomai (now available with black gulaman juice for thirst quenching). 2. How much does the Master Siomai foodcart franchise cost? – The foodcart franchise business package costs Php 280,000.00 all in. You can see more details with regards to the inclusions such as utilities, products, tools and quipments, crew and personnel plus other materials such as for cleaning and maintenance. 3. What is the official Master Siomai website and hotline numbers to contact and inquire regarding franchise application and other details? – Their official website is mastersiomai.com but if you want to go directly to the franchise information, you can type this url string – mastersiomai.com/franchising. The hotline numbers, according to their site are (02) 351-1854 or (02) 282-4941 or (02) 355-5323. – First thing you should do as part of the requirement is to look for your own location where you will put up and position the kiosk / foodcart. Second is to call their hotline telephone numbers stated above in #3 FAQ. If approved of your site / location, you have to pay the 50% deposit of the franchise cost for the construction of the full cart / kiosk assembly. Attend a business operation meeting. Crew and personnel orientation and training. Signing of the franchise agreement finally, the full payment of your balance of 50% of the remaining franchise fee upon delivery of the food cart. This entry was posted in Food Stalls, Foodcart, How To, Requirements and tagged foodcart franchise, how much is cost, how to apply for franchise, master siomai, siomai cart, siomai house. Bookmark the permalink. please send me a complete applications or set me a appoinment for this franchise. We are students from the Polytechnic University of the Philippines taking up Bachelor of Science in Accountancy. And under this program, we have the ­­Accounting Thesis subject that requires us to furnish an undergraduate thesis with the topic of our choice. Thus, we have come up with the idea of making franchising our topic. In line with this said matter, we also have decided to make your company our subject for study. We will be conducting a personal interview with a representative from your company to gather the necessary information vital to the fulfillment of this project. We know that such an interview would be demanding on your part but we will be very much appreciative of your company if you consider our request. Rest assured that the information you provide us will be treated with utmost confidentiality and will be used solely for academic matters as we really need this to accomplish the study as well as widen our horizon about the aforementioned topic. We hope that you could be of great help to us in the fulfillment of this said requirement. You may leave a message for us using the information below. Hi I’m here in Canada and I am looking to put a business but here in Cnada do you think you can help me thanks. Kung Pao Siomai is established and operated by the Rollo family. Having a business of food cart designing and building, the Rollo couple got to see the loop holes and the long term ROI (Return of Investment) from various franchising food cart businesses. With that in mind, they’ve decided to start their own siomai food cart franchise and compete with the other food cart brands. With their son, a starting chef, they formulated their own siomai recipe that has a unique taste and texture. 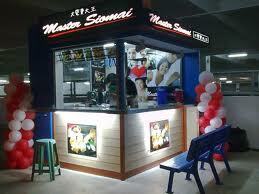 I would like to franchise for a master siomai food cart, I want also to know the price of twin and trio combinations. Please furnish me all the costs and details on how to avail these products. Thank you. – Do i need to find a place or you will be the one to do that.